Origin and Habitat: Morro Copiapo, south-westerly from Caldera, on the north Chilean coast. 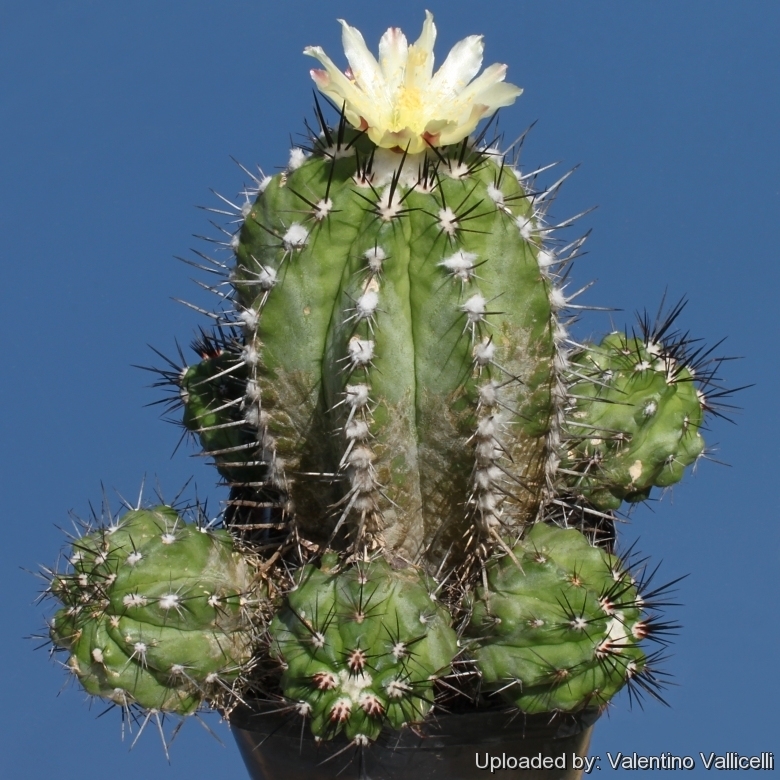 Description: Body upright, columnar-cylindrical, almost like a Cereus, forming a somewhat open clump. Ribs: 10-14, very sharp, broad obtuse, separated by broad intervals, neither tubercled nor notched up to 1 cm tall, straight. Areoles: Rounded 0,5-1 cm in diameter, closely approaching each other or touching one another, young areoles with abundant grey or brownish wool, becoming ash-grey or black and bare in age. 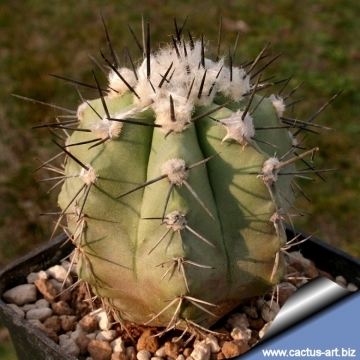 Spines: Dark-brown becoming chalky-white as they ages. 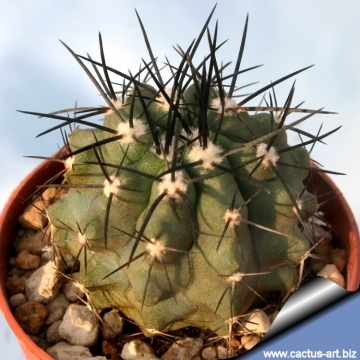 Spines clusters very closely set. Central spines: 1 standing up vertically, very rigid, porrect, 2 to 3(-4) cm long (longer than the radials). Roots: Conical-napifom root-stock, rapidly tapering with thick neck. 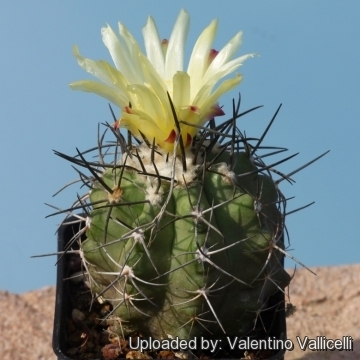 Flowers: 3 to 4 developing at a time, with characteristic Copiapoa flower-scent, sprouting out from the wool of the crown, yellow, scarcely standing out from the spines, when completely open only 2,5 to 3 cm in diameter, with lanceolate-spathulate perianth segments approx 15 mm long, 7 mm large, narrower below, rounded off above, pale yellow, the outermost reddish at the tips and expanded. Floral tube funnel-form 1-1.5 cm long, exterior with a few larger, greenish scales becoming red-brown above. Nectar chamber 3-5 mm. long, 3-4 mm wide half open. Filaments pale yellow, the lower ones 12 mm long, the upper 7-9 mm long, anthers citron yellow. Style 17-20 mm long, 2 mm thick, (longer than the stamens) with 9-15 rayed pale yellow stigma lobes, without any narrowing above the ovary. Fruits: Small, 10 up to 12 mm long, 8 up to 12 mm broad, barrel shaped, (ovary 3 to 7 mm in diameter) pale green, or with a faint red tint, at the upper end greener or more reddish-brown, usually quite hairless and scale-less, or with few (1 or 3) red scales. Dehising from a lid-like top cracking when ripe. Seeds: 1 mm long, 0,7 mm wide, 0,3 mm thick, black, somewhat shiny, with very small verrucae, hilum at the basal end inclined half ventral-wards, oval, white. 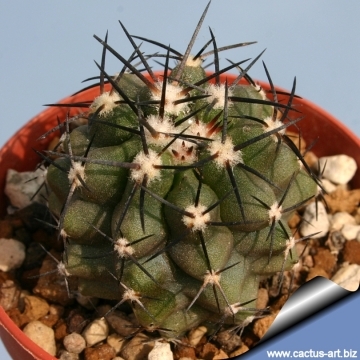 Notes: Systematically this species stands between Copiapoa dura which grows further to the south-east and Copiapoa bridgesii which grows to the north. 3) Brickell, Christopher (1996). “Gardener's Encyclopedia of Plants & Flowers.” Colour Library Books. p. 443. ISBN 1-85833-472-1.